US Congress - Help build the Congressional Friends of Hungary (CFH)... ACTION ALERT! 1956 National Memorial - A call for support and donations to finally have a fitting national memorial in the nation's capital! DC: INVITATION / MEGHIVÓ: TAVASZI MAGYAR BÁL April 12th, 2008! szeretettel meghív igazolásának 50-ik évfordulója ünneplésére. Join or RENEW! 2008 Renewal Time! Renew or join online! AHF / Amazon Store - Buy Books Online! A special message from Bryan Dawson, AHF Executive Chairman: "100 years ago, Hungarian American leaders recognized that unity brought strength and founded our organization to represent the millions of Hungarians in the United States. 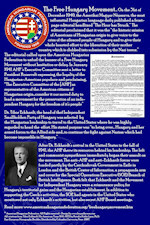 AHF's first President, Tivadar Kohányi appealed to our community issuing his Szózat (appeal) in 1907 writing, "Amerika egy millió magyarja, nemcsak hogy követeljük, de keresztül is visszük azt, hogy Magyarország népének ugyanabban a szabadságban, ugyanabban az igazságban, ugyanabban a jólétben legyen resze, mint a mely szabadság, igazság, es jólét abban az Amerikában van amelynek lakósai, polgárai vagyunk.” Roughly translated, this means, "We, America’s 1 million Hungarians, do not just demand, but will work to ensure that the people of Hungary may partake in the same freedom, the same justice, the same prosperity as we, citizens of America, partake.” It is 2008 and many of our Hungarian brothers and sisters in the Carpathian Basin still wait to partake. We Hungarian Americans represent a unique perspective and culture - one that has flourished in freedom and one that must be preserved. We also have an obligation to work to ensure the spirit of democracy continues to be, as Louis Kossuth said, "the spirit of our age" both here and abroad. As my first term as Chairman of the Executive Committee draws to a close, I also appeal to you. Our work is not done. Only in unity can we find strength. We need your help... Join us! 3/24/2008 - Hungary and the United States Sign Visa Waiver Agreement... On Monday, March 17, 2008, Hungary, Slovakia and Lithuania signed a Visa Waiver Program memorandum of understanding with the United States. This agreement is intended to pave the way to help the three countries qualify for visa waiver free travel to the United States later this year. The American Hungarian Federation (along with other individuals and organizations) has long supported visa waiver for Hungary, speaking out about the need to provide Hungarians the same right to visa free travel that Americans enjoy when traveling to Hungary. Washington Times publishes AHF Letter to the Editor. 10/2/2007 - Senator Larry Craig and the Hungarian (Dis)Connection: The Hungarians of Voivodina. AHF's chair of the International Affairs Committee recaps the effort to protect the minority rights of the Hungarian community in the Vojvodina region of northern Serbia and the Senator's role in blocking those efforts. The bi-partisan, bicameral measure had stated that "during the past 10 years...ethnic cleansing has already driven 50,000 ethnic Hungarians out of the province of Voivodina." Ongoing - ACTION ALERT: Help build the Congressional Friends of Hungary (CFH)... On February 12, the late Congressman Tom Lantos (D-CA), Chairman of the U.S. Committee on Foreign Affairs, and Congressman Christopher Shays (R-CT) circulated a "Dear Colleague" letter inviting Members of Congress to join the Congressional Friends of Hungary (CFH). The purpose of the caucus, as noted by the co-chairs, is "to recognize the contributions of Hungarian-Americans to the United States and to strengthen the ties between the United States and Hungary." 3) Find your local state representatives by entering your zip code in the tool on our Website at [ALERTS]. This legislative tool will provide addresses, emails, fax and phone numbers. IT IS BEST TO CALL and then FAX the letter. "Hello, my name is _____. I am a constituent of Representative _____ and also a member of the American Hungarian Federation. On February 12th, the late Congressmen Tom Lantos and Christopher Shays distributed a "Dear Colleague Letter" entitled "Join the Congressional Friends of Hungary." I am calling to ask the Congressman to join the CFH. I and the other Americans of Hungarian descent in his/her district would be grateful for his/her support. I will fax you a letter that also includes the contact name in Congressman Lantos' office should you need more information." I am one of your constituents who lives in ______. I call your attention to the "Dear Colleague Letter" distributed on February 12, 2007 by Congressmen Tom Lantos and Christopher Shays, titled "Join the Congressional Friends of Hungary." I urge you to consider joining this Congressional Caucus, whose main purpose is to strengthen the ties between the American and Hungarian people and to recognize the Hungarian-American community. There are a number of Hungarian-Americans in your district and our community would be grateful for your support. Your wise counsel would be an asset in the operation of this caucus, particularly in the areas of human rights and minority rights. Buy ALL your books, videos, electronics and other gifts on AHF's Amazon Store. It costs nothing extra to you, but Amazon contributes a small percentage to AHF. The AHF store features books and articles written by AHF members on both our main site and our 1956 Portal for publications devoted to 1956. 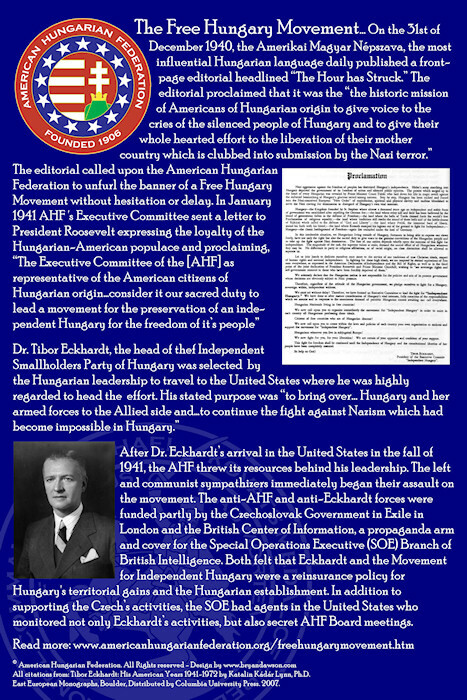 AHF, Tibor Eckhardt, and the "Movement for Independent Hungary," 1941 - 1942: Seeking to extract Hungary from the Axis sphere - by Bryan Dawson and Katalin Kádár Lynn, Ph.D. Author Susanna (Zsuzsanna) Lápossy is a Freedom Circle Member of the American Hungarian Federation. Her book, the first part of a trilogy entitled "Life behind the iron curtain" contains lesser-known facts about 20th century Hungary as seen through a middle-class family. MAGYAR BÁL INVITATION / MEGHIVÓ: April 12th, 2008! The Annual Hungarian Spring Ball - A very special evening benefitting AHF's 2008 programs and the Hungarian Scouts of Washington! The phenomenal New York Continental Band and traditional dance performance by local scouts will make for another very special evening of dancing and debutantes. $120 Tickets may be ordered ONLINE! nagykövetségek, konzulátusok és kirendeltségek elıtt, peticíó átadással. A NEW YORKI DEMONSTRÁCIÓRA SZINTÉN 2008. ÁPRILIS 19-én Du. 3 ÓRAKOR KERÜL SOR. CÍM: 801 SECOND AVENUE, A 2. és 3. AVE KÖZÖTT. Ezt követöen április 22-én 11 órától Strasbourgban az Európa Parlament épülete elıtt tiltakozunk és delegációnk átnyújtja peticíónkat az Európa Parlament képviselöinek. Minden csapattagot, volt csapattagot, vezetot, cserkészszülot és barátot szeretettel várunk! 41 sz. Lorántffy Zsuzsanna lcscs. 3/17/2007 - Great Painter, Sculptor and Hungarian, Gabriella Koszorus-Varsa passes away in her home in Washington, DC. Heralded as a master of portraits, figure compositions, as well as sculptures, Ms. Koszorus-Varsa's depiction of the charge of the cavalry during the battle of Charleston in ``Fidelissimus ad Mortem'' is a magnificent master work and hung in the US Capitol and was displayed at the AHF Congressional Reception in honor of the 50th Anniversary of the Hungarian Revolution. In 2007, she was honored with AHF's highest award, the Col. Commandant Michael Kovats Medal of Freedom for "her lifetime accomplishments and dedication to the preservation of our Hungarian heritage." A supporter of AHF for many decades and responsible for the design of some AHF stamps during its 1956 relief efforts and beyond. 11/6/2007 - AHF mourns the loss of Mózsi Ferenc, author of thirteen volumes of poetry. He was born in Budapest. He left Hungary in 1970 and lived for a time in Belgium pursuing literary studies at the Catholic University of Louvain. In 1974 he moved to the United States and founded and edited the Hungarian critical and artistic review Szivárvány. At the 1984 World Congress of Poetry in Marrakech, Morocco, he was awarded an Honorary Doctorate in Poetry. Ferenc Mózsi lived in Chicago and owned Sebok Travel Services. 8/31/2007 - We mourn the loss of Imre Gazda, President of the Dallas-Fort Worth Metroplex Magyar Cultural Circle who passed away on Friday August 31st, 2007 at the age of 64 after a brief but courageous battle with laryngeal cancer. Ford Chief Engineer: Designed the Model T and Model A Ford, the Fordson Tractor, invented the Ignition Plug and the Planetary Gearbox, and prepared the production of Liberty aircraft engines. One of the most talented technical forebears in American automotive industry, J�zsef Galamb had a very eventful career. 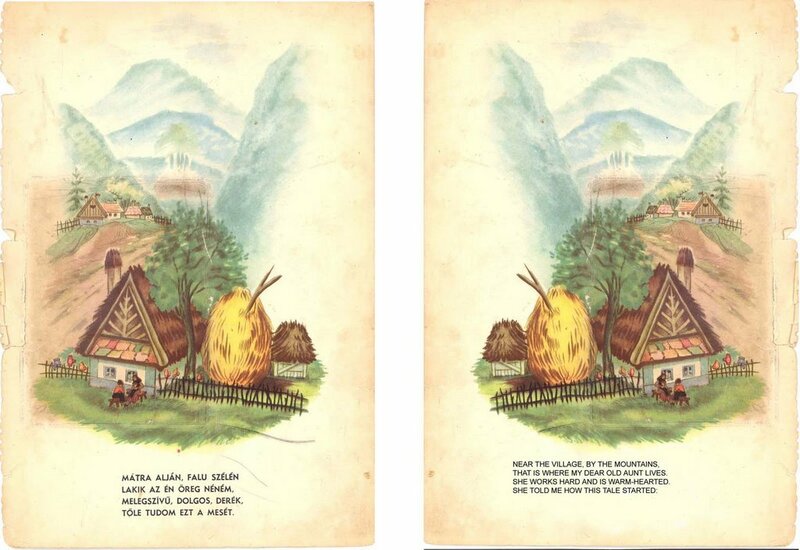 He was born in the small Hungarian town of Mak� in 1881. After graduating at the Budapest Technical University, he started to work in a wagon factory and later joined the biggest Hungarian automobile factory in Arad, Transylvania (now Oradea, Rumania after annexation in 1920). At the beginning of the 1900s he studied manufacturing processes in the German Adler car factory, finally in 1903 crossed the Atlantic and tried his luck in the United States. He turned up in several cities including St. Louis, Cleveland, and Detroit. He began to work with Ford in December 1905. Strength can only be found in unity! Please join AHF and work together on common ground issues! There are two easy ways to Join and Support us! PRIVACY NOTICE: AHF will not share its mailing list with anyone...Period. AHF also uses this list SPARINGLY.